Chișinău Etymology and namesThe origin of the city's name is unclear, but in one version, the name comes from the archaic Romanian word chișla (meaning "spring", "source of water") and nouă ("new"), because it was built around a small spring, at the corner of Pușkin and Albișoara streets.The other version, formulated by Ștefan Ciobanu, Romanian historian and academician, holds that the name was formed the same way as the name of Chișineu (alternative spelling: Chișinău) in Western Romania, near the border with Hungary. 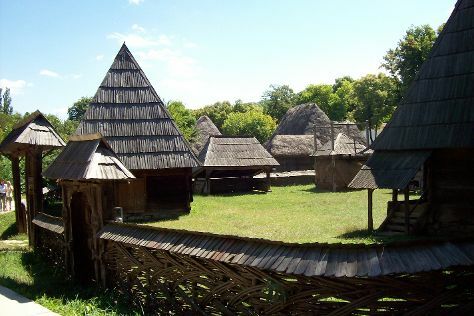 Kick off your visit on the 21st (Tue): pause for some serene contemplation at The Metropolitan Cathedral “Nativity of the Lord”, then stroll through Stefan cel Mare Park, then see the interesting displays at Muzeul National de Arheologie si Istorie a MoldoveiMuzeul National de Arheologie si Istorie a Moldovei, and finally make a trip to Victory Memorial and Eternal Flame. To see other places to visit, more things to do, ratings, and more tourist information, you can read our Chisinau trip planner. Manchester, UK to Chisinau is an approximately 8-hour flight. You can also drive; or take a bus. The time zone difference moving from Greenwich Mean Time to Eastern European Time is 2 hours. In March, daily temperatures in Chisinau can reach 11°C, while at night they dip to 0°C. Wrap up your sightseeing on the 22nd (Wed) to allow time to travel to Bucharest. The booming city of Bucharest is a sophisticated metropolis with a high contrast of old- and new-world architecture. Bucharest is known for sightseeing, museums, parks, historic sites, and nightlife. Your plan includes some of its best attractions: listen to music at Romanian Athenaeum, ponder the world of politics at Palace of Parliament, wander the streets of Old Town, and tour the pleasant surroundings at Herastrau Park. To see more things to do, maps, traveler tips, and other tourist information, use the Bucharest custom trip planner. Traveling by flight from Chisinau to Bucharest takes 4.5 hours. Alternatively, you can drive; or take a bus. In March in Bucharest, expect temperatures between 13°C during the day and 1°C at night. Wrap up your sightseeing on the 25th (Sat) to allow time to travel back home.